Two weeks ago, I mentioned here that John Stuart Mill’s On Liberty celebrated its 150th anniversary this year. This year also marks the anniversary of another classic text: Adam Smith’s The Theory of Moral Sentiments, which turns 250 this year. Although Smith will always be most closely associated with The Wealth of Nations, some Smith fans (like me) consider The Theory of Moral Sentiments to be his real masterpiece. First published in 1759, the book is a far more robust theory of life, ethics, human relations, and justice. Indeed, as Dan Klein and Russ Roberts of George Mason University note in this excellent podcast, The Wealth of Nations is best viewed as an installment in, or an extension of, a much larger project that Smith really brought together more holistically in Theory of Moral Sentiments. [Note: Klein and Roberts have an amazing 6-part podcast series celebrating the 250th anniversary of the book, all of which can be found here]. [Smith held] that people are born with a moral sense, just as they have inborn ideas of beauty or harmony. Our conscience tells us what is right and wrong: and that is something innate, not something given us by lawmakers or by rational analysis. And to bolster it we also have a natural fellow-feeling, which Smith calls “sympathy”. Between them, these natural senses of conscience and sympathy ensure that human beings can and do live together in orderly and beneficial social organizations. So our morality is the product of our nature, not our reason. And Smith would go on to argue that the same ‘invisible hand’ created beneficial social patterns out of our economic actions too. The Theory of Moral Sentiments establishes a new liberalism, in which social organization is seen as the outcome of human action but not necessarily of human design. Indeed, our unplanned social order is far more complex and functional than anything we could reason out for ourselves (a point which Marxist politicians forgot, to their cost). When we approve of any character or action, the sentiments which we feel, are, according to the foregoing system, derived from four sources, which are in some respects different from one another. 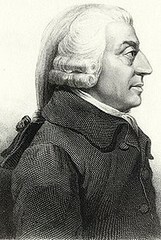 First, we sympathize with the motives of the agent; secondly, we enter into the gratitude of those who receive the benefit of his actions; thirdly, we observe that his conduct has been agreeable to the general rules by which those two sympathies generally act; and, last of all, when we consider such actions as making a part of a system of behaviour which tends to promote the happiness either of the individual or of the society, they appear to derive a beauty from this utility, not unlike that which we ascribe to any well-contrived machine. (3) help others when you can (or at least give great consideration / deference to their views /desires). And, generally speaking, Smith believes that, if left to their own devices, that’s exactly what most people will do. They will balance their own self-interests and the interests and wishes of others. Death is the greatest evil which one man can inflict upon another, and excites the highest degree of resentment in those who are immediately connected with the slain. Murder, therefore, is the most atrocious of all crimes which affect individuals only, in the sight both of mankind, and of the person who has committed it. To be deprived of that which we are possessed of, is a greater evil than to be disappointed of what we have only the expectation. Breach of property, therefore, theft and robbery, which take from us what we are possessed of, are greater crimes than breach of contract, which only disappoints us of what we expected. The most sacred laws of justice, therefore, those whose violation seems to call loudest for vengeance and punishment, are the laws which guard the life and person of our neighbour; the next are those which guard his property and possessions; and last of all come those which guard what are called his personal rights, or what is due to him from the promises of others. I love that passage! Many classical liberal thinkers, most notably F.A. Hayek, would go on to build on this point. But Smith really nailed it first, and quite eloquently, here in The Theory of Moral Sentiments. Anyway, go read (or re-read) this book. It is a masterpiece.